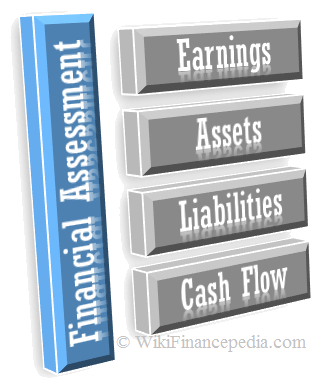 In this personal finance tutorial course we will understand about what is financial assessment? How to evaluate personal finance? How to conduct financial assessment for a company? How to perform individual financial assessment. If a person can perform assessment in the right way, it will benefit individual in planning expenses and savings pretty well. Personal financial assessment or Individual financial assessment assist you to evaluate your personal budget after taxes. Such financial assessment is used to evaluate your contribution towards your income vs expenses. Personal financial assessment example: If a person earns $50,000, he can plan his personal budget by contributing 20% into savings and 80% into expenses. Such kind of financial planning will be much beneficial in his lifetime then the person who is fails to conduct wealth management for himself. Personal finance management starts with the assessment of the current financial situation. A family unit is generally considered in personal finance. Assessment is such an important part of money management. Until one is not aware of current situation nothing can be done much. Assets means anything tangible or intangible that can be owned and has some monitory value or can produce some value. In other words, an asset is something which can be converted into cash. Typical examples of assets are real estate properties, jewelry, vehicle, etc. An asset could be more than the property, jewelry and vehicle. As it could be anything that can be converted into cash, so assets include the bank balance, business, insurance, fixed deposits, owned shares, mutual funds, savings, PF funds, etc. 1. Current Assets: They are the cash in hand and anything which could be converted into cash in a short period of time. Technically, 1 year or the operational cycle. The short-term investments, receivables, current inventory and pre-paid expenses are considered as current assets. 2. Fixed Assets: They are the long-term use assets like property. In finance, there is a term called as PPE (property, plant, and equipment) is normally used to refer fixed assets. So, it includes furniture, tools, machinery, computer, land, building, etc. The long-term investments are also seen as fixed assets, such as bonds, shares, insurance, PF funds etc. 3. Intangible Assets: The assets which we cannot touch with our hands are intangible assets such as copyrights, goodwill, trade names, patents, franchise etc. 4. Tangible Assets: The physical objects fall in this group. So, everything that is lying at your home which you can touch is your tangible asset. For example: books, toys, utensils, television, air condition, etc. Just to mention here, liquid assets are those assets which are in your hand which you can spend. Example: cash in hand or in the bank and receivable cash. These days, there are several assets calculators are available on the internet which can help in calculating the assets. They are seldom called as Net worth calculators. It is simple as that. It is the total income of a family unit or an individual or a company. It includes the monthly incoming cash from salaries, rent coming from a rented property, take home cash earned in a business, pension, earning through part time jobs, work from home, etc. Some once in a while kind of earnings are not considered for personal finance assessment until they are big enough to be called as assets. Some of the important documents to see in order to assess the earnings are – balance sheet and income statement. The income statement shows the net earning in a financial year while balance sheet shows the net profit earned in a financial year. The balance sheet shows the earnings minus paid liabilities. There is one more important document which one should consider, it is credit report. It is also referred as the credit score. It is the detailed history of the loans and credit cards of a person. It shows how well the loans and credit card payments are paid. The clean history (regularly paid EMIs and credit card bills) scores well in the credit report. These scores are really important for credibility on an individual financial assessment or a financial assessment of a company, as on the basis of credit scores financial institutions and banks sanction the loans. 1. Loans & Mortgages: The money you have taken from someone on a temporary basis. Generally, the interest is applied on loans which have to be paid by the person who has taken the loan. The mortgage is different from loans in a sense of secured or unsecured loan. A loan which is security (generally over a real estate property) is called as a mortgage. 2. Accounts Payable: These are the debts which must be paid off within a pre-decided time or a given timeframe. This term is more commonly used in business or a company, but in personal finance or an individual finance planning, this should be considered as it is same as paying rents, utility bills etc. 3. Deferred Revenue: It is the unearned cash. For example – advance payments against some service to be rendered. All this is mentioned here just to provide enough knowledge so that you can see things clearly and can assess your liabilities well. 4. Accrued Expense: It is the liability which has to be paid in near future. Like state taxes, sales tax, income tax, etc. It is the statement which defines how well one is managing his regular earnings as well as paying the liabilities. It helps in figuring out any time difference which should be filled between earned cash and paid liabilities. For example – the bills could be raised (supposed to be paid) on the date before some get the earned cash. This sometimes creates a big problem though earning and paying is happening well if seen over a month time. One should conduct financial assessment on the regular basis. Individual financial assessment is as important as financial assessment of a company. This will help in building great wealth and can plan pretty well for the retirement income. This will also keep you clam and give you peace of mind during your bad times where people fails to meet their day to day expenses.